Start your journey along the Trans-Mongolian railway in stunning Moscow, then visit glorious Kazan to see the cradle of Tatar culture. Continue to Ekaterinburg, set right on the border of Europe and Asia while passing through the mighty Ural Mountains. Absorb the beauty of Lake Baikal and vast wilderness of the Great Steppe, before you finally reach Ulan Bator. Explore the Buddhist and normandic traditions of Mongolia and see the largest equestrian statue in the world - the statue of Genghis Khan, founder of the Mongol Empire. Sit back and relax, while we take care of everything for you. *Tour departures available from mid-May to mid-October. Contact your travel specialist for details. Welcome to the gorgeous capital of Russia - Moscow! Your driver meets you at the airport and transfers you to your centrally located hotel for check-in. Note: You can extend your journey to St. Petersburg. Contact your travel specialist for more information. This morning is free for you to continue exploring the magnificent Moscow city center on your own. In the afternoon you check out from your hotel, meet your guide and enjoy a guided tour of the world-famous treasure trove of the Russian fine art, the Tretyakov Gallery, where you have amazing time viewing the gems of its collection, including the famous masterpieces of Ivan Aivazovsky, Mikhail Vrubel, and Viktor Vasnetsov. After the tour of the Tretyakov gallery, you have a quick subway ride to explore the most beautiful stations of Moscow Subway, which is known to be one of the most beautiful and efficient metro systems in the world. Then you see the spectacular Cathedral of Christ the Savior and learn the story of its destruction and reconstruction. After the tour, you are transferred to the train station where you board your train and start your amazing journey across Eurasia! Breakfast and one meal onboard are included. In the morning your train arrives in Kazan - the beautiful capital of the Republic of Tatarstan and the center of Tatar culture in Russia. Upon arrival, your guide meets you at the train station, and together you walk to your centrally located hotel for check-in and breakfast. After some time for rest, you explore the historical ensemble of the Kazan Kremlin. During the tour, you see the main treasures of the complex, including one of the largest mosques in Russia - the Qol Sharif Mosque, the leaning Soyembika Tower, the Annunciation Cathedral and the Governor's Palace. Later you continue your tour to the Kazan Family Center located on the bank of the Kazanka River. The unique form of the building reminds the Tatar from Cauldron and beautifully reflects local culture. After a break for lunch (which is not included), you proceed to the chak-chak museum. Here you learn the secrets of making the traditional Tatar sweet. You are also invited for tea drinking with chak-chak, baursak, and Tatar pastila. Breakfast and tasting are included. Early in the morning, you walk to the train station to continue your journey to the capital of Ural - Ekaterinburg. You spend this day on board your train enjoying fantastic scenery passing by your window. In the evening you arrive in Ekaterinburg. Your driver meets you at the train station and transfers you to your centrally located hotel for overnight. Breakfast box and one meal onboard are included. After breakfast, you meet your guide and driver and enjoy a guided sightseeing tour around the most remarkable city landmarks. After the tour, you return to your hotel and have the rest of the evening free. You spend this day on board the train enjoying fantastic scenery passing by your window. You spend this day on board your train enjoying fantastic scenery passing by your window. Early in the morning, you arrive in Irkutsk, informally known as "Paris of Siberia" for its rich architecture and colorful life. Upon arrival, you are transferred right to the Lake Baikal shore and check in to your hotel. After a 2-hour rest, you enjoy a guided tour around Listvyanka Village. During the tour, you visit the Baikal Limnological Museum and Aquarium that houses an interesting display of the unique flora and fauna of the lake. After breakfast, you check out from your hotel and say "Good-bye" to Lake Baikal! Your driver takes you to Irkutsk for a guided tour around the most remarkable city's attractions. You are then driven to one of the main monasteries in Siberia - Sigh Monastery is also known as the Znamensky Monastery. You also explore the Kazan Church, which with its Byzantine-style decorations looks like a fairy tower, and Block 130, the historical zone with many colorful wooden houses and buildings constructed in the 17th century. 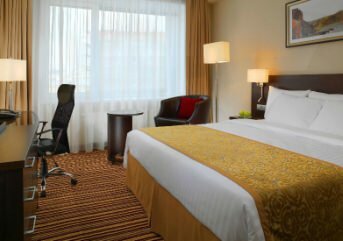 After the tour, you are transferred to centrally located hotel, and the rest of the day is free for you to explore the city on your own. Following breakfast, you check out from your hotel and your driver transfers you to the train station where you board a train that takes you to the final destination of your Trans-Siberian tour - Ulan Bator. In the morning you arrive in the capital of Mongolia - Ulan Bator. Your guide meets you at the train station and takes you to your hotel to freshen up and have breakfast. Later you meet your guide and explore the legendary Mongolian Buddhist Gandan Monastery in Ulan Bator. You then depart from the capital and in about 1.5 hours arrive at the camp and enjoy traditional lunch. Later you take the tour of the picturesque Gorkhi-Terelji National Park and visit its most popular attractions, including the famous Turtle Rock and the Aryabal Temple located on a steep hill. At the entrance to the temple’s grounds, there is a long walking path leading to the set of 108 steep stairs that symbolize the elephant’s elongated trunk. You can rise up to the temple and enjoy the magnificent view of surrounding valleys. In the evening you enjoy dinner at the camp. You spend this night in a traditional Mongolian yurt. Following breakfast at the ger camp, you meet your guide and start the day with a visit to a nomadic family to learn more about their culture, authentic lifestyle and traditions. You continue to the banks of the Tuul River where an iconic 40-meters tall equestrian statue of Genghis Khan is located. During the tour, you explore the interiors of the statue, see a replica of Genghis Khan’s legendary golden whip and walk through the chest and neck of the statue's horse up to its head. At the top, you enjoy an excellent view of the complex area and the surrounding scenery. After a break for lunch, you make your way to the famous Zaisan Hill which offers the best panorama of Ulan Bator and then to the cashmere factory where you learn how raw materials are being transformed into a thread and then into clothing. Later you are transferred to your hotel in Ulan Bator and have the rest of the day free. After breakfast, you meet your guide at the hotel lobby and go on a walking city tour around the most interesting attractions of Ulan Bator. After the tour, you return to the hotel to take some rest or continue exploring the city center on your own. In the evening you attend an amazing Mongolian folk show at the State National Song and Dance Academic Ensemble of Mongolia (transfers are included). After the show the rest of the evening is free. Note: You can extend your trip to Beijing or Vladivostok. Contact your travel specialist for more information.